So, a couple of weeks ago, Apple announced that the iPad release date for the UK was delayed. Deprived of my chance of a shiny new gadget, and on top of the news that the new iPhone 4 release Just Won’t Work in most respects on my phone which as of the announcement was only one revision behind current, I gave in, bit the bullet, and bought an HTC Desire on a non-contract basis. Starting now, I’m going to bring together my thoughts on the differences. Some of these things are a perspective thing, possibly. I’ve been using an iPhone for close to two years, and the Android for less than a month. 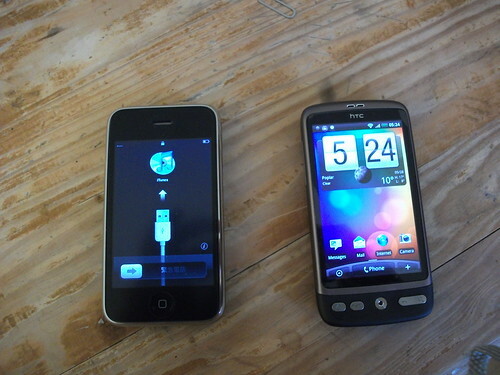 On the other hand, my Android device is brand new, and my iPhone is nearly two revisions out of date. Around two years ago, I eventually got an iPhone. Apple’s industrial design goes all the way to the box, which is made of high quality cardboard, opens easily, and feels high quality. The Desire box clearly takes inspiration from it, although with a more traditional – for phones – slide out packaging. One of the neat things about the apple box is the way the inside of the top is padded where it touches the screen, avoiding the need for cheap plastic film to protect it in transit. The HTC box is still a step above most phone boxes, however. Out of the box, the iPhone turns on, and contains a semi-charged battery. Out of the box, once you’ve taken the back off, installed the battery (and memory card if you need one), the Desire also turns on and contains a semi-charged battery. The Desire’s back case removal seems flimsy and breakable, and while you’re only going to need to remove it for rare things – new sim, new memory card, swapping batteries – it’s something of a point of worry. Maybe it’s more sturdy than I credit it for. The iPhone box contains a special glorified pin for poking into the hole to eject the battery and install the sim. I turned on the Android device. I was taken though a slightly under-brief tutorial on how to use the on-screen keyboard (it’s interesting that Apple don’t do this. They give you a keyboard, and expect their usability design to do the rest. The Android keyboard is almost exactly the same, but they don’t trust their own design enough to expect you to be able to use it. On the alternate, the “hold to select special symbols” functionality is explicitly covered in the tutorial, and is the one thing iPhone users used to miss. The 3GS may have fixed this somehow). During a setup wizard thing, I gave it my Google Apps account details and the wifi password, and it slurped down my contacts and emails. It asked for twitter, flickr and facebook accounts, and I gave it these too, and then it slurped down contact photos from facebook for anyone who put their mobile numbers into their profile. It showed me how to use the wigetized home screen, and then left me to it. I turned on the iPhone. It demanded to be connected to iTunes. I was on a train, and my computer was far away. I turned it back off, put it in its box, in its bag, and sat quietly reading my new phone contract until I got home. Once home, and the phone was connected to iTunes, it ran roughly the same as the android thing without the tutorial (There’s a mini-tutorial in a manual that comes with it). I used NuevaSync to treat my google account as an exchange account, which gave me all the automatic syncing I mentioned above (There’s now a way to do this natively using Google, but it never worked for me as well as Nueva does). The Facebook app for iPhone does the contact picture syncing I mentioned (and by the same method, linking contacts to facebook profiles via a “fb://$fbid” URL in the “URLs” section). One of my primary uses for my phone is as a media player, so I wish to be able to sync my music and videos as painlessly as possible. All my music already being in iTunes (with complicated inter-layered automatic playlists, like “Stuff you rate highly but haven’t listened to in a while, plus some new, unrated, stuff.”) iTunes sync is most handy. By default, Android’s music, video and podcast sync is the most old-school thing imaginable, mount as USB device, drag, drop. This works, but has no real “sync” support. Better is DoubleTwist, an app that is attempting to make music sync on the Android as painless as the iPhone. It has successfully imported my iTunes playlists (mostly. No folder support, and imports automatic playlists as flat) and synced the ones I selected across. It even supports updating podcasts, though it appears to put them straight into the music application and there’s no tracking of what’s been listened to or not. There’s no two-way syncing at all, in fact. Also, Doubletwist is slower than wading though frozen treacle. Given that the iPhone inherits a lot of this structure from the iPods, it’s no real suprise that being able to sync your own music and song metadata to and from the device is one of the iPhone’s highlights, but the rest of the industry has had eight years to make this stuff even slightly more palatable than dragging files hither and yon; and to launch a “competitor” to the iPhone while thinking that this stuff in any way doesn’t matter is just astoundingly stupid. That Android even needs Doubletwist to exist is proof that Google have missed much of what made the iPhone quite so popular, and even if it didn’t there’s more. Wait, what? The iphone needs a pin to get at the sim card, and you think it *wins* at usability? Okay, I’m finally certain; Apple are definitely putting some brain-warping chemical in the global water supply. Yes. It needs a pointy thing, which is supplied in the box, to do something you’re ideally only going to do once. The desire requires you to break off a fragile plastic tabbed thing, and remove the battery, to remove the sim or memory card. That’s great until you do want to switch your SIM for some reason, and the little gadget is long gone! Then you’ll need some kind of sharp implement. In the same way that the desire needs a screwdriver or fingernails or something, only without the feeling that you’re about to irrepairably break the back of your phone. And the main reason why it wasn’t there was because of the Android permissions system, where apps have to tell you up front if they want to do things like use the Internet, access hardware sensors, control phone calls, etc. Integrating that with mass updates is not so easy. Yeah, I’ve seen that, and I’ll mention it in the dedicated article, but for the purposes of this, I’m reviewing latest-released versions of the OS, so I’m not going to judge Android against stuff coming up in iPhone 4, and I’m not going to judge iPhone 3 against Android 2.2. I for one would rather have an Apple ipad or soon to come Google tablet. There was a whole run of security implications to consider with an “Update All” button. And I admit, it’s not the funnest part of my day updating a dozen apps. But the “Update All” is coming with Froyo, which should be with us desire lovers in the next month.